Easy to buy. Easy to maintain. Easy on the eyes. For professional-grade touchless towel dispensing that helps reduce waste, cost-in-use and the spread of germs, it’s an easy choice. 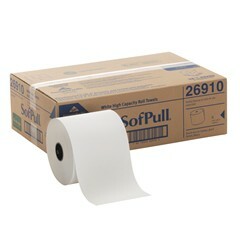 SofPull automated high- capacity dispensers and roll towels give you industry-leading GP quality, reliability and cost control – all in a streamlined design with just the features you need.